What is All Natural High? How does All Natural High work? All Natural High is a special 30-minute audio recording, which uses special sounds to change your brainwave patterns - and your mood! It's designed to recreate the effects of euphoric stimulants, bringing about a feeling of excitement, anticipation and a mellow feel-good state of mind. It does this using brainwave entrainment, which is a proven science based on over 100 years of neural research. Every state of mind has a unique electrical signature that can be detected in the brain. These signatures are known as "brainwaves" - and can be measured using scientific equipment, such as EEG machines. Using special audio pulses, the All Natural High session helps to recreate specific brainwave patterns - such as those associated with a euphoric mood, feelings of excitement, and a mellow feel-good state of mind. This process is known as "brainwave entrainment" - and is backed by over 100 years of scientific research. To learn more about the science behind All Natural High, click here. Definitely. 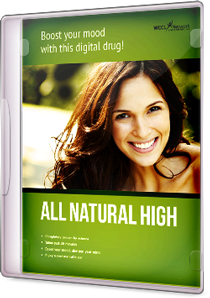 Unlike conventional drugs, All Natural High is completely safe - helping you to recreate the natural highs and states you may enjoy in your daily life, yet controlled and activated on-demand. There are some exceptions: notably, people suffering from epilepsy should not use any form of brainwave entrainment. To read our full list of warnings and disclaimers, please click here. The Main All-Natural High Session - 30 minutes of euphoric beats, with music - guaranteed to boost your mood and enhance your evening! BONUS: Synthetic Background Version - The same All Natural High session, but without music. Play in the background with your favourite tunes! 21-Day Money-Back Guarantee - Try out All Natural High for three whole weeks. If you're not thrilled at the results, we'll refund you! If you're interested in promoting our site, we’ll pay you 50% of every order placed through your link. Payment is made after 35 days through PayPal. And it's easy to get started. Just click here to learn more. I've got other questions. Who can I ask? We have a dedicated support site set up to answer any queries you may have. Just click here and ask away! The myHelpHub.com site guarantees to answer all queries within one business day; however our typical response time is just 4 hours. We're also frequently available in online chat, via the site.